Only one bridge in Hawaii -- a steel-arch truss bridge on the Big Island -- needs inspection because of its similarity to the bridge in Minneapolis that collapsed, killing four people, injuring 79 and causing up to 30 to be missing. 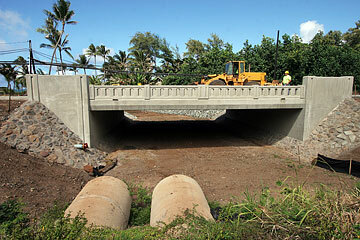 State officials, meanwhile, assured the public that all Hawaii bridges are safe. About 14 percent of the state's 1,110 bridges were found to be structurally deficient, while 32.2 percent were labeled functionally obsolete (not meeting federal design standards). State transportation officials noted that most of Hawaii's bridges are made of concrete, not steel. More maintenance is needed to keep steel from rusting, officials said. An analysis of 2006 Federal Highway Administration data found that Minnesota bridges were generally in better shape than those in other states. Of the 10 worst-off counties with significant numbers of bridges, seven are in Oklahoma or Nebraska. Within the next few days, inspectors plan to examine a steel arch-truss bridge on the Big Island similar to the bridge that collapsed in Minneapolis. In the wake of the Minnesota catastrophe, state officials reassured the public that all Hawaii bridges are safe. "We feel pretty comfortable with the structural integrity of our bridges," said Brennon Morioka, deputy director of the state Department of Transportation. "We just want the public to know that all of our bridges are safe. They should not have concerns about driving over these bridges." The planned inspection follows an alert from federal officials yesterday calling for all states to immediately inspect all steel deck truss bridges. There are 756 steel deck truss bridges in the United States, according to the Federal Highway Administration. Inspectors plan to examine Kolekole Bridge on Route 19 just outside Hilo. Three years ago, seismic retrofit work was done to the bridge to prevent earthquake damage. Structural repairs and repainting of the bridge to prevent rust corrosion were also done, said Scott Ishikawa, Department of Transportation spokesman. 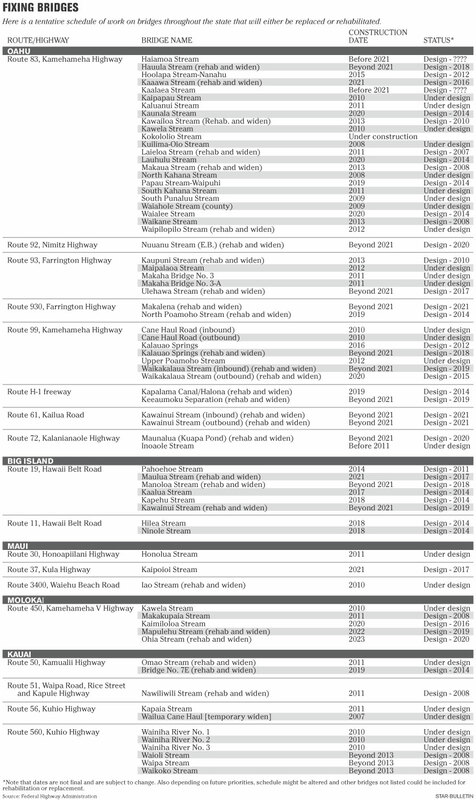 Ishikawa said officials also might look into six other steel-truss bridges: Hanalei Bridge and three Wainiha bridges on Kauai, Karsten Thot Bridge in Wahiawa and Bascule Bridge on Sand Island Road. The six bridges do not fall under the same category as the Minneapolis bridge because they lack the arch design. Engineers pointed out that most bridges constructed in Hawaii are made of concrete, not steel. "Steel bridges pose a high maintenance problem," said Paul Santo, bridge engineer for the state Department of the Transportation Highways Division. Steel bridges rust over time and require more maintenance than concrete bridges, state officials said. 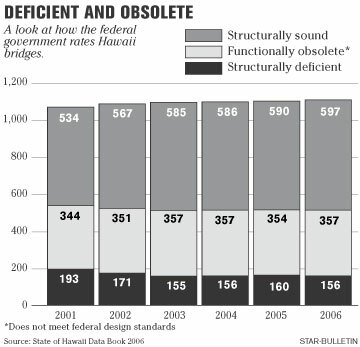 According to the 2006 State of Hawaii Data Book, 156 bridges, or 14 percent of 1,110 bridges in the state, were determined to be structurally deficient, while 357 bridges or 32.2 percent were determined to be functionally obsolete. Morioka said about 40 percent of bridges in Hawaii do not meet current federal standards that are either described as structurally deficient or functionally obsolete. But he stressed the classifications are misleading, and it does not mean the bridges are unsafe. "One example about functionally deficient bridges is any one-lane bridge that we find in rural-neighborhood island areas. Those bridges will always remain obsolete," Morioka said. "The community really wants to maintain the character for their rural communities, and so those kinds of bridges, we don't have any plans to bring them up to standard." Ian Robertson, professor of structural engineering at the University of Hawaii at Manoa, added, "Single-lane (bridges) are automatically deficient according to federal guidelines." Hawaii bridges deemed safe might also be described as functionally obsolete under federal design standards just because shoulders are not wide enough. Many historic bridges that either fall in the structurally deficient or functionally obsolete categories were built in the early 1900s, Morioka said. The October 2006 earthquake was a testament to how stable Hawaii's bridges are. Only two concrete bridges -- Kawailii Bridge on Hawaii Belt Road on the Hamakua Coast and Honokoa Bridge on Akoni Pule Highway in Kawaihae on the Big Island -- were damaged by the temblor. "That kind of just goes to (say) how well many of our bridges are built," Morioka said. Over the next six years, an estimated $280 million of rehabilitation and replacement work is scheduled to take place throughout the state. Money will cover improvements to 46 bridges. State and county bridges are inspected every two years, according to officials. Of the 1,110 bridges in Hawaii, the state owns 750. The rest are owned by the four counties. Of the Minneapolis catastrophe, Robertson noted the rarity of bridge collapses that occur in the nation. "This is one bridge out of tens of thousands of bridges around the country. It's obviously unfortunate that it collapsed and caused deaths," Robertson said. "It's not a common occurrence at all." An analysis of 2006 Federal Highway Administration data found that Minnesota bridges were generally in better shape than those in other states. Only about 6 percent of the state's 20,000 bridges were listed as being structurally deficient. In Oklahoma nearly 27 percent of bridges were cited by the federal government as being structurally deficient, the highest percentage among the states. Among counties with more than 100 bridges, the problem appears to be most significant in the Midwest.